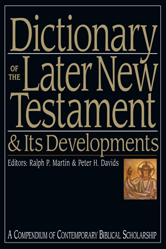 Editors: Martin, Ralph P. and Davids, Peter H.
The Dictionary of the Later New Testament & Its Developments offers a summa of New Testament studies. Designed to bring students, teachers, pastors and general readers up to date and up to speed, this one-of-a-kind reference volume presents more information than any other single work--dealing exclusively with the theology, literature, background and scholarship of the later New Testament and the apostolic church. ACTS OF PETER AND THE TWELVE APOSTLES. 5 EZRA AND 6 EZRA. LETTER OF PETER TO PHILIP.